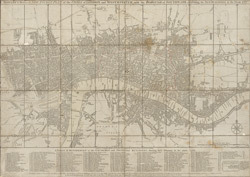 BOWLES'S Reduced NEW POCKET PLAN of the CITIES of LONDON and WESTMINSTER, with the BOROUGH of SOUTHWARK, exhibiting the NEW BUILDINGS to the YEAR 1787.
bl.uk > Online Gallery Home	> Online exhibitions	> Crace Collection of Maps of London	> BOWLES'S Reduced NEW POCKET PLAN of the CITIES of LONDON and WESTMINSTER, with the BOROUGH of SOUTHWARK, exhibiting the NEW BUILDINGS to the YEAR 1787. This is the sixth edition of Bowles's Reduced New Pocket Plan. The map was reissued 11 times between 1777 and 1799. It includes a table of references to churches and principal buildings. The built-up areas of the City of London are represented by stippling, with the city boundaries delineated it red. The scale is given in miles and furlongs.